"Lovebirds". I had so much fun with this couple! From the minute I first met them I knew we were going to have a lot of fun together...that we were a perfect fit. Their wedding day was absolutely perfect in every regard. A beautiful warm day with blue skies and bright sunshine...the perfect day for their waterfront wedding reception at Lombardi’s on the Sound at The Port Jefferson Country Club at Belle Terre, just outside of Port Jefferson Village, New York. During the cocktail hour their guests were treated to warm, gentle breezes on the deck overlooking the Long Island Sound. This was the kind of day that every bride hopes and wishes for.This picture, however, was not taken on their wedding day. It was taken during a post wedding couture photography session. This couple had a lot of great ideas about what they wanted in their wedding pictures. Unfortunately, they did not have a lot of time on their wedding day, what with an 11:30AM ceremony with the cocktail and dinner reception immediately following.So I spent another day with this awesome couple. They were both very athletic and they both loved the water. A session at the beach was a no-brainer. I took the couple up to the Town of Huntington Crab Meadow Beach in Northport, NY. 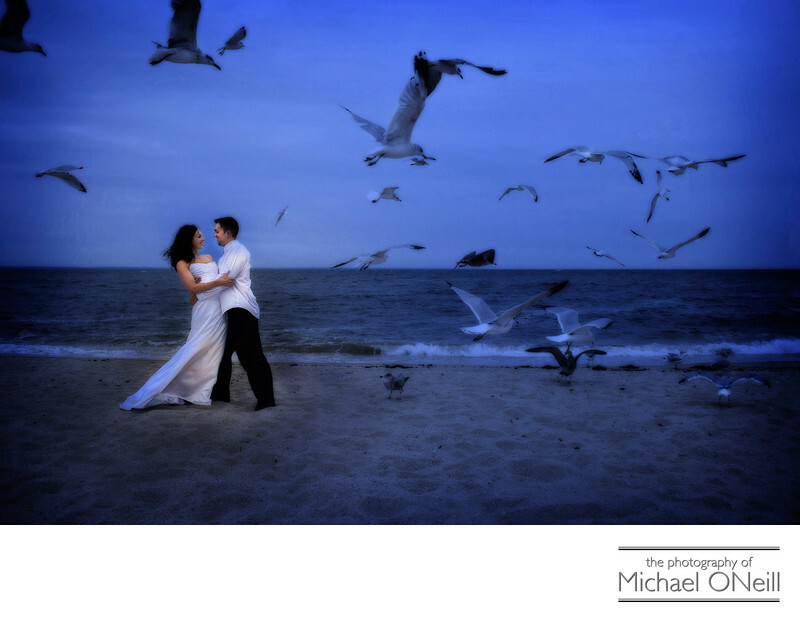 A large population of birds resides at this beach and a small ziplock bag full of Cheerios, being tossed about by my assistant, was enough to get and hold their attention while we created this fun shot.Pre-wedding or post-wedding couture photography sessions are becoming more and more popular. Often times my couples have great ideas for their wedding photography but logistically can’t make them happen on the wedding day. If you’re planning a Lombardi’s on the Sound wedding; or a wedding at Villa Lombardi’s in Holbrook, NY or Lombardi’s on the Bay in Patchogue, New York; give me a call. I have been working with the Lombardi family for some 20 years now and they proudly recommend my professional photography services. And ...if you have a great concept...a vision...for some extraordinary wedding pictures, I’m your man. Give me a call and we’ll kick around some fun, creative ideas together.